Through the original post, “Portrait of the Artist with a Nerd,” I was introduced to one of my wonderful readers, Sammi1228. I do so love hearing from readers. That is why I write. I already know these stories. I tell them to you for the love of working the words, and for your entertainment and engagement. So I was delighted when Sammi1228 contacted me about the original story. The two of us have begun an email correspondence on this particular story and on the artist it is about, John R. Byron. Sammi has gathered some current information on him. So, with Sammi’s permission, I will reconstruct, paraphrase, deconstruct, and quote some of our correspondence. The email also included a reference to the lithograph numbers. The “Encounter at Weathertop” lithograph I have is 67/1000. That is, it is 67th out of 1000 total copies. I explained the value of these numbers, the most important being that there are only 1000 copies of this print, and that way back when Mr. Byron expressed to me he would never reprint it. Having a copy of something rare is a valuable thing. In a follow-up email, Sammi explained how her mother got the lithograph in a garage sale. As such, neither of them knew the artist and had no background on the image. Though she did not say it, I suppose there may have been questions in their minds if it was indeed about “The Lord of the Rings” or just something like it. I explained to her that beyond its limited characteristics, it was doubtful that Mr. Byron’s work would ever enter the hallowed halls of those like Picasso or Warhol. Still, as a limited edition it had value, and more importantly, as a gift from her mother it had much more value. She should treasure it. My blog post gave her an origin story for her print, and I hope that has increased its value for her. In later emails she asked about framing the work, which led to an interesting and I believe useful discourse. As for what my suggestions would be, definitely have it matted – black with a nice, wide border. As for a frame, that can go so many ways, and it really depends on your decor. If you have a more modern / rococo or eclectic style, I might go with a small, simple frame – black metal, silver metal, brass, gold, something like that. If you have a more old-world decor, wood definitely, but I don’t think I would go big and fancy. Let the artwork speak, not the frame. In Sammi’s subsequent email, thanking me for the information I had given, she asked, “Is Mr. Byron still around and doing art?” As I pointed out in the original blog post, I had looked for information on John R. Byron, to no avail. But her questions and interest sent me on another search, and lo and behold I found a tiny scrap. 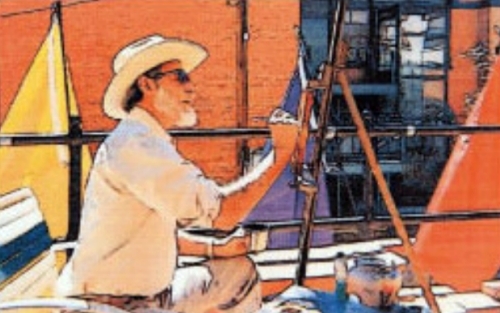 John Byron was one of many featured artists in a gallery in Bisbee, Arizona, or at least he was at one time. All I could find on him, reflected in some of the comments on the original blog post, was a single page document containing nothing more than a few short paragraphs and some images of some of his other work. (http://www.discoverbisbee.com/documents/MicrosoftWord-JOHNBYRONBIO.pdf) I sent a request to the folk in Bisbee, but I did not receive a reply. I did call the number that is shown on that page, however it was no longer in use. I passed all this information on to Sammi. Sammi had more intestinal fortitude that I, and actually called the gallery in Bisbee (http://www.facebook.com/pages/55-Main-Gallery/146441015447356). That call shed some more light. Sammi has learned that John Byron passed away in 2012*, during his 69th year. Some might say, with me writing the original blog post in December of 2012, there was some synchronicity in the universe. I could only wish he had seen the post, but I feel sure he did not. Still, some might say there were some sympathetic waves taking place. Sammi wanted to share at least one of John’s pieces that is displayed in the Bisbee gallery, so I present it here. “At Home”. 30×20 oil on canvas by John Byron, 1983. Currently in a private collection. Sammi asked that this one be placed in the post. 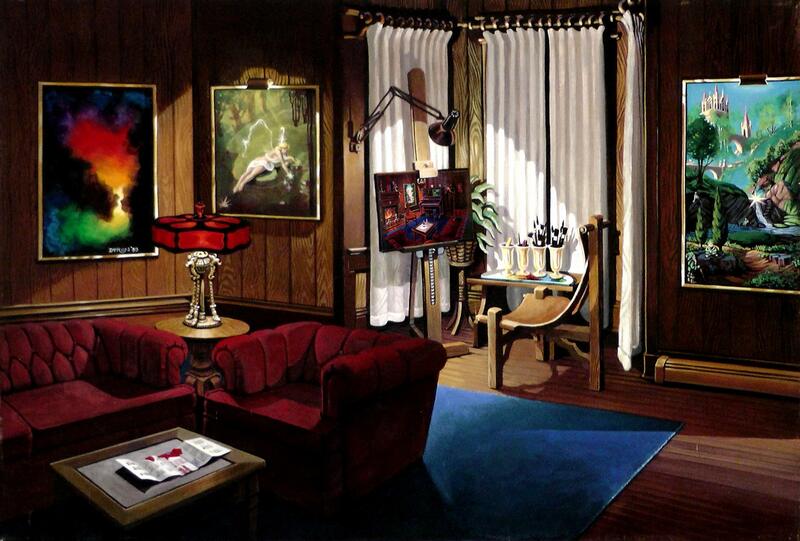 It is a painting of Mr. Byron’s living room, where you can see several of his works on display, and an easel with a work in progress which shows the other side of the room. If you look carefully, the artwork hanging on the right side is very similar to the artwork at the top of this post. In the gallery, it is titled “Hidden People”. In the artwork above, with careful inspection you can see some dwarf like folk in the lower left. (You can click the image to see a larger version of it.) These are not evident in the piece that is in the gallery. But that was something John did. He considered himself a “working artist”. He did not paint a painting and consider it done. He worked the concept, painting it again and again, until he had a finished work he was happy with. I have to say, I have always enjoyed his use of light. He was not afraid of contrast. The light against dark creates wonderful depth. I also have one that I want so share – a self-portrait of the artist. To John Byron, I feel certain that I was just one of a million on-lookers. But to me, John was one in a million and will always be remembered. Thank you, Sammi, for sharing with the world. And John, thank you for all the bright colors. This entry was posted in My Life and tagged Art, Lord of the Rings, Pictures, The Hobbit, Writing. Bookmark the permalink. You, like very few of us, have something of John Byron’s to treasure. Enjoy it. I use to tell my child, “If you had everything, where would you put it?” So enjoy what you do have. Always remember that you have a piece of John near you. 55 Main Gallery is the curator of the remaining original art pieces and prints by John Robbins Byron. Hope we can add to your personal experiences with John by updating some important information. He painted in an illustrative style and was in fact an artist of Lord of The Rings art, as well as many other genres’ such as; surrealistic,high fantasy, mystical/spiritual, historical cowboy/mining. He spent the last ten or so years of his life in Bisbee, AZ. where he worked primarily in desert landscapes. John Robbins Byron Died November 15th 2012. We would like to provide you, the publisher of this blog, with a watermarked proof to replace the digital image of the living room painting that currently appears on your blog. We hope your fond memories of John and his life of commitment to his art, will compel you to help protect John Robbins Byron’s estate maintain the copy write and value of his remaining work. We ask that you please e-mail us and we will provide the watermarked image for legal use of it on your blog. If you, your loyal readers, or other self-proclaimed Lord of the Rings nerds wonder if they might be able acquire a print ($30 to $50) an or original painting($100 to $980), a truly wonderful way to honor his memory, to please contact us for info. As a side note, there did seem to be a correlation between John’s death in November 2012 and your original post in December 2012. We scheduled the opening reception for John Byron’s retrospective art show on the first anniversary of his passing. Although in his later years, John was rather reclusive, we felt his presence during the reception and while hanging his show. Certainly you, who also had a connection to John and his art felt something too that may have lead to the creation of your original post. Thank you for the additional, and corrected information. I would suggest to all followers of “The Lord of the Rings” (whether or not you consider yourself a nerd) to look into John’s illustrations and conceptions of the work. And to anyone interested in original artwork of any kind, give John’s work, as well as other artists in the 55 Main Gallery a look. Artists are all around you. Support them. I have been looking for John Byron’s whereabouts for many years. I moved to New Orleans from NY in 1976. In that year or closely following, he had a traveling exhibit of his Lord of the Rings subjects that stopped in the lake forest shopping center near NO. 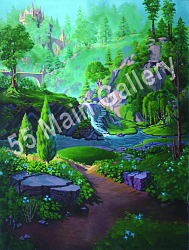 I purchased many prints from him including a small 12″ x 14″ oil on canvas of Bilbo Baggins. Even though he has passed, I am thankful for finding at least some information. Thanks to all. I would enjoy seeing a photo or your Bilbo painting, or any of the prints you have from John. I too had been looking for John Byron. I purchased an oil on canvas painting of Smaug with some hard earned cash way back when in the 70’s I believe at the Nanuet Mall in Rockland County NY. I so wanted to purchase Weathertop but just couldn’t afford it at the time. I have no clue what the asking price was. I’ve treasured my painting ever since. I’d be more then happy to send you a copy. Thanks for sharing. We would all enjoy a picture of your John Byron painting of Smaug. The art keeps the artist alive. I included Mr. Byron in the dedication of my new book, as the book does deal with artwork in a small way, and as one particular passage was drawn directly from my experiences with Mr. Byron – in particular, the way he would work his signature into the artwork.